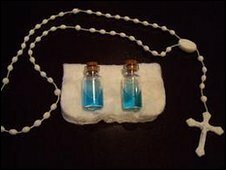 Two glass phials said to contain the ghosts of an old man and a young girl have sold for NZ$2,000 ($1,395:£935) in an online auction in New Zealand. The auction, which ended on Monday night, attracted more than 200,000 page views on the Trade Me website. Avie Woodbury said the ghosts had been captured in her Christchurch house by an exorcist and stored in holy water. The top bidder, an electronic cigarette company, said it was looking for ideas on what to do with the ghosts. Ms Woodbury told bidders she had experienced "bizarre activity" in her home. "I would get things like the jug boiling itself, touching on the back of my neck, voices from other rooms, and items going missing then turning up in weird places," she said. "The dog was mental, he wouldn't go into certain rooms and my brother's daughter would stay with me and she said she spoke to a little girl." But after a member of a local spiritualist church performed an exorcism in July last year, the house had returned to normal, said Ms Woodbury. The ghost of the old man and the girl had been safely contained in holy water, she said, which "sort of puts them to sleep". "I just want to get rid of them as they scare me. But someone might like these to play with," she said. The lot was viewed nearly 220,000 times in a week and received scores of comments, ranging from practical issues about how to ensure the ghosts remained in the bottles to concerns over the morality of selling another person's spirit. Other enquiries were more sceptical, with one reader suggesting he too had spirits in bottles in a cupboard at home. "I think they are called Jim Beam and the other is Johnnie Walker," he said. The closing bid went to a company called Safer Smoke NZ, which produces electronic cigarette substitutes - it paid NZ$2,830 for the two bottles. The company said it was now inviting suggestions as to what they should do with the ghosts. Ms Woodbury said all profits from the sale would be donated to an animal charity, after she had paid the exorcist's fees.